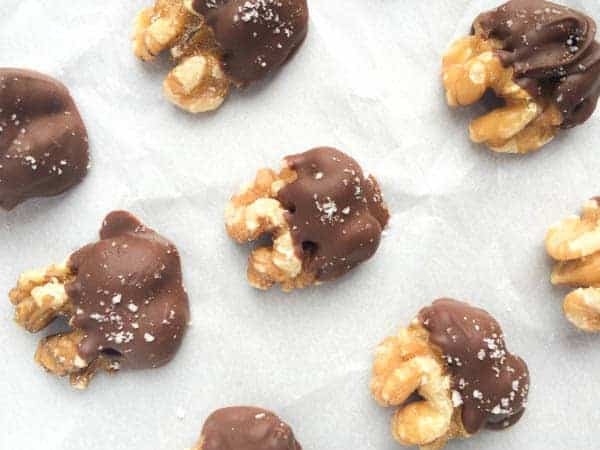 A quick, easy and healthy snack, you are going to love these walnut halves dipped in chocolate and sprinkled with sea salt. Few things make me happier than the combination of nuts, chocolate and salt. 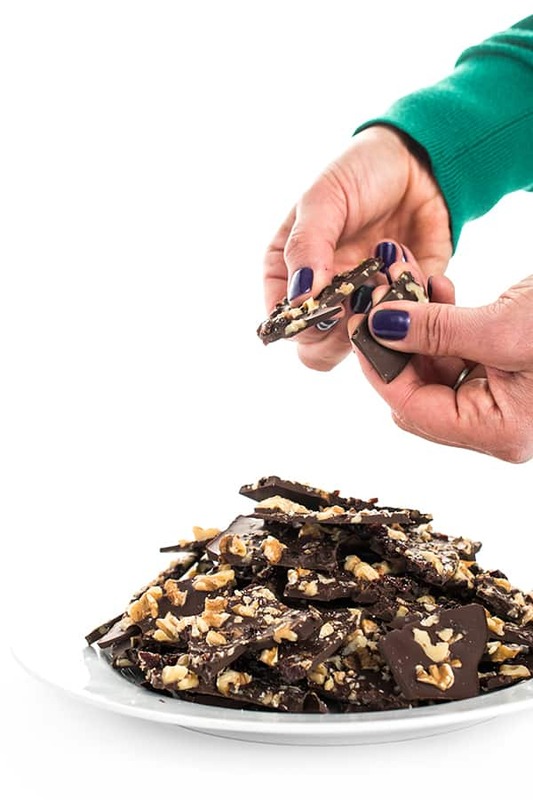 Crunchy walnuts, rich dark chocolate and a sprinkle of sea salt… is there anything better? 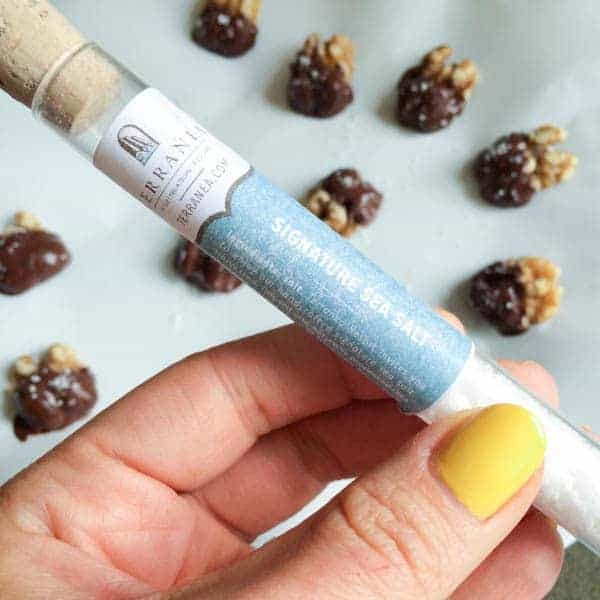 Inspired by my travels, I thought it only made sense to cover these Diamond of California walnuts with sea salt harvested in the same state that I took home from my recent visit to Terranea. If you’ve ever bought chocolate covered nuts at a specialty shop or grocery store, you likely know how pricey they can get. I challenge you to try making them at home! 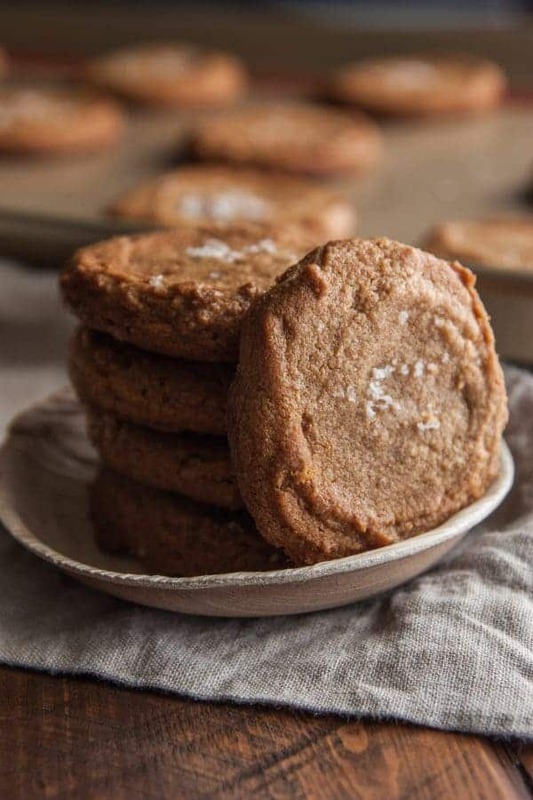 Not only are they easy to make (seriously – it takes 10 minutes!) but it’s a lot more cost effective. How tasty do these look? We love eating them cold from the fridge but they are tasty at room temp or even frozen. Place chocolate in a microwave-safe bowl and heat on high for 45-60 seconds or until smooth and creamy. 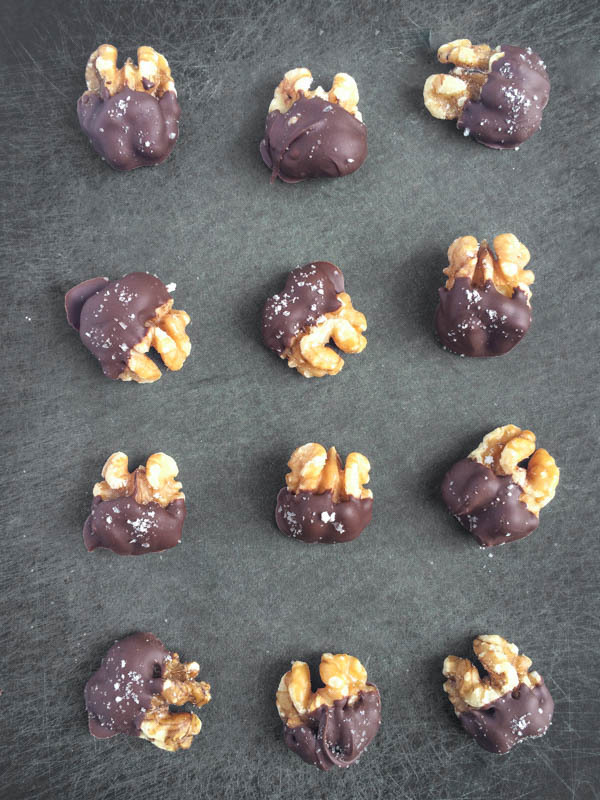 Dip each walnut half in the chocolate and place on a plate or tray lined with parchment paper. 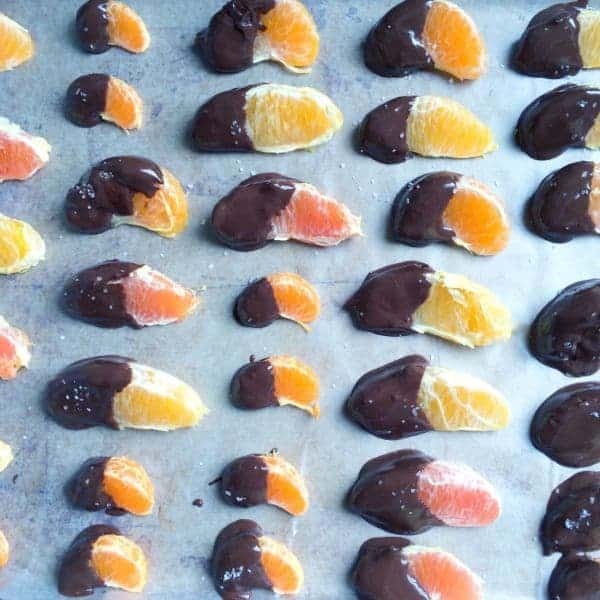 Sprinkle with sea salt then refrigerate walnuts until chocolate sets, 30 minutes or longer. For more delicious snacks check out my Healthy Snacks Recipes board! Wonderful!! Love dark chocolate and nuts/fruit. This would be great for a wedding shower we have coming up. Even I, who is not a big nut/dessert fan, think these look amazing!! These would be so perfect to make as a gift at the holidays! Same here Lisa!! Never been hugely into desserts! Liz, this would be my favorite snack EVER! 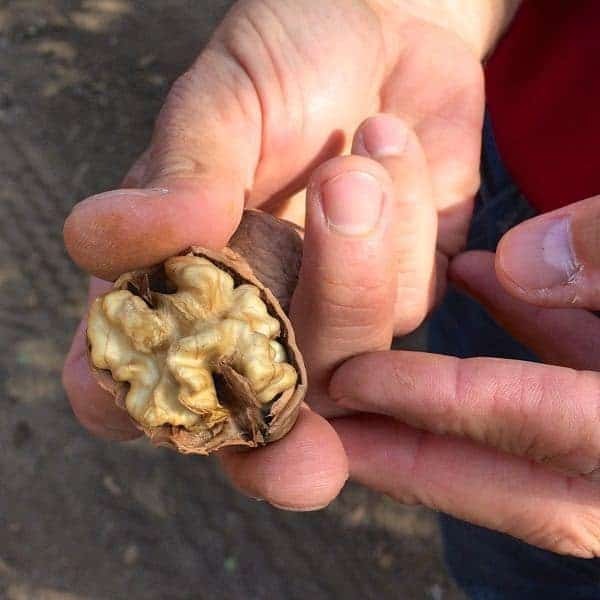 Walnuts are one of my favorites. I seriously couldn’t stop eating these girl! I legit love this Liz! It’s my level of easy (because I’m so busy during the summers I need all the easy and quick things I can get) and sounds so delicious! I’m totally going to be making these stat! You will love these girl!! keep them chilled – best in the summer! These are seriously snacking perfection! I can’t wait to give them a try! I hope you make them – you’ll love them! Cold from the fridge is good, especially when it’s so hot out! These would make a wonderful gift. Or would be a great snack to sneak into the movies. Yes!! We loved eating them cold from the fridge! Such a perfect little snack! Oh my goodness!! These look oh so good!! I love chocolate!! So the walnuts and chocolate oh yes! So simple and so good. I love walnuts! Oh Im so glad Catherine!! Enjoy!